So i got a Sharkoon Silenstorm 500w sfx-l unit that i previously used. I always felt it was slightly underpowered for my 980ti +6700 setup. The other day while removing the gpu i damaged the CPU power cable (ncase m1 so thight). Unable to get a replacement, i got the SF600. But the SF600 is a total nightmare (imo). Extremely noisy, coil whine and it makes the rest of the system coil whine as well. Since I'm kinda silent freak, that is no good. At this point I just want to go back to my Sharkoon unit. Can I use this cable kit with my Sharkoon PSU? 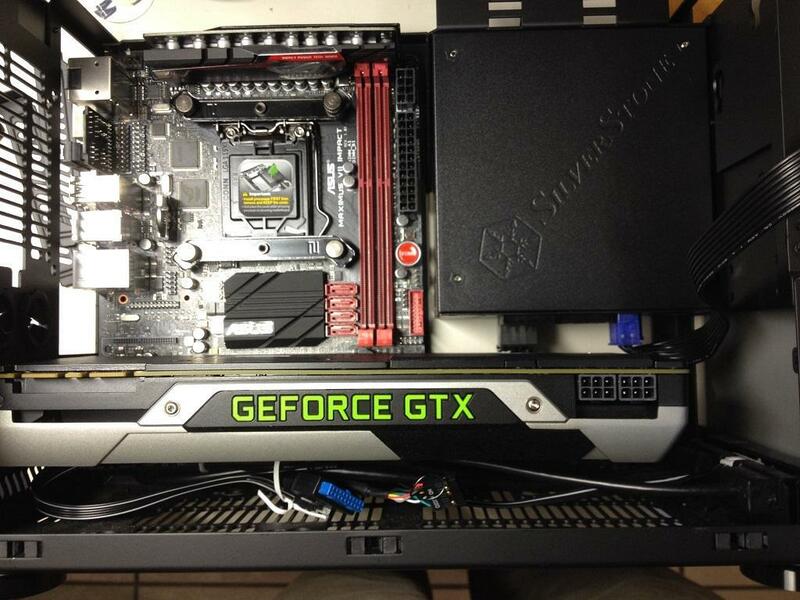 That is a kit for the Silverstone SX500 sfx unit that is the same OEM as my sharkoon unit. They seem very similar, but I can't find any info on pinout, and I can only order the kit on amazon and not local (norway), so returning the cables are kind of expensive if they don't fit. Why not go with the Corsair SF450, it's the best SFX PSU out there and really silent, more silent as the SF600. The coil whine however isn't normal, but that's where warranty is for. RMA the SF series. It shouldn't be that noisy. There's obviously something wrong with the unit. That said: No SFX unit is EVER going to be as quiet as an SFX-L. SFX-L's are cheaper/easier to make due to the fact that power density isn't a priority, and a 120mm fan is always going to be quieter than an 80 or 92mm fan. Back to your Sharkoon: The Sharkoon is the exact same PSU as the SilverStone SFX-L Gold 500W. Even the modular interface LAYOUT is the same. But it's only an assumption that the pinout is the same. You should be able to check this easily with a DMM; sticking the probes into the pins of the modular connector. And if you find it is the same as SilverStone's pinout, why buy the whole kit? You can buy SilverStone cables separately. It shouldn't be that noisy. There's obviously something wrong with the unit. IIRC you said something similar of Aris' one. Aris's was at least as loud as the SF450 at 450W and got louder over 450W. And he never complained about coil whine, nor have I heard of many issues of coil whine with SF series. Aris's was at least as loud as the SF450 at 450W and got louder over 450W. His SF600 was nowhere near his SF450 quietness level. @OP: sorry for have gone OT. Last edited by quest for silence; 02-08-2017 at 04:26 AM. Jon, actually your SFX is more silent than the competiitors SFX-L models under a wide load range simply because their fan makes bearing noise. The issue is that according to the outervision PSU calculator, my system draws 481w at peak, and 531w is suggested. Thats why I felt the sharkoon 500w was a bit to lacking. I would rather have a SFX-L unit because of the fan, but because I have mine in a ncase M1 and the connectors on the psu are "protruding" out of the case, the cables are pressed against the gpu. The issue with Outervision PSU calculator is that it doesn't work and people are using it anyway. I thought you prefer less noise, not more. If you want the most silent and best SFX PSU then go with the SF450. Wich power supply calc is then safe to use? 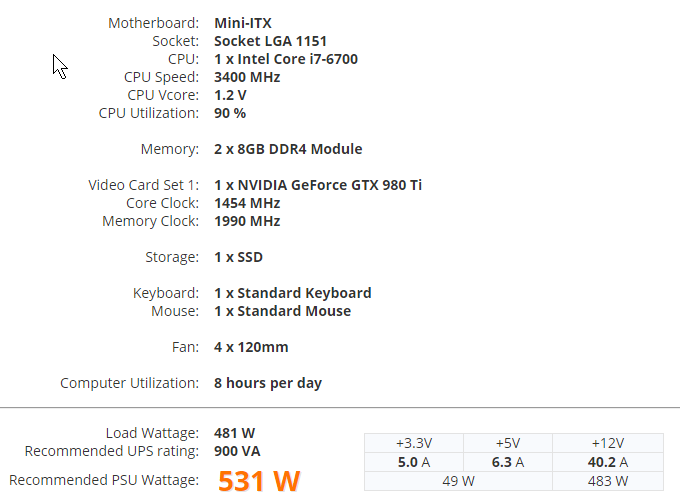 How much power does my system really need? Okay, so the SF450 is really THAT quiet?